I have been commissioned to work on a bespoke range of giftware for Lambeth Palace, home and work place of the Archbishop of Canterbury, and am pleased to say that the gift shop now stocks my handmade coasters. Lambeth Palace, the garden and gift shop is open on the first Friday of the month during the summer for visits from 12 to 3 pm as well as at other times of the year. I've been busy running lots of workshops in my studio. 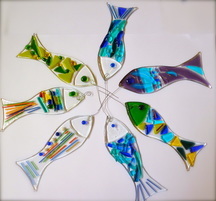 If you and a friend or two would like to have a creative morning exploring fused glass. Dates are on my 'courses' page and please get in touch via my 'contact' page. No experience necessary and all tools and materials are provided. During November and December I have been busy running a series of workshops in my studio near Guildford/Woking for small groups of up to 4 people, beginners and improvers. We've had lots of creative fun and made some wonderful Christmassy decorations! If you would like to take part in a workshop in the new year, do get in touch via my contact page. My autumn exhibition was with he North Surrey Group of Society of Designer Craftsmen - The Makers' Art 2017. The Exhibition formed two parts - Part 1 from 5th to 16th September and Part 2 from 19th to 30th September (I will be exhibiting during Part 2). All exhibitors were selected members of The Society of Designer Craftsmen. Yvonne Arnaud Art Exhibition. An exhibition of paintings, photography, printmaking, glass and sculpture at at the Mill Studio open Monday to Saturday, 10 am to 7.30 pm, and 10-13 July and 20 July 10 am to 6 pm. With 'meet the artists' on Saturday 8 and 15 July. I shall be there all day Saturday 8 July . 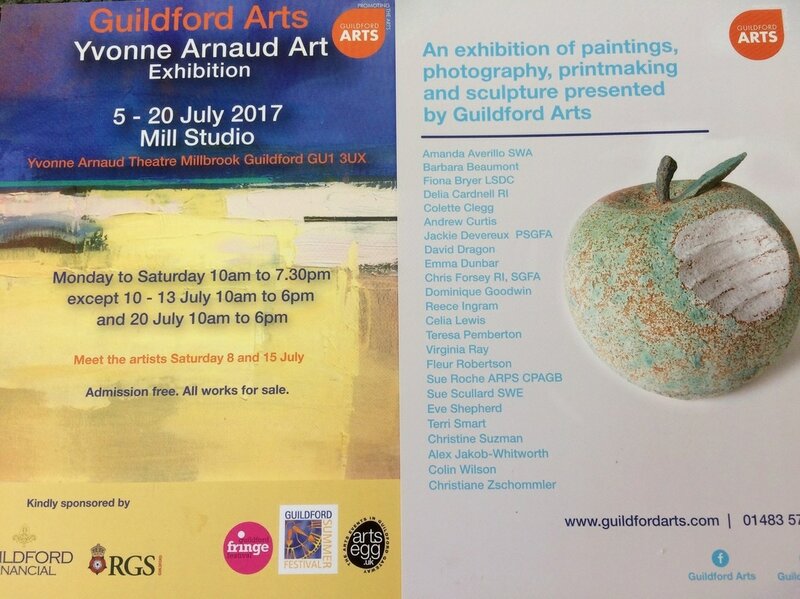 All work is by local artists from Guildford Arts and is for sale. The AppArt Godalming Exhibition is now in full swing with a diverse range of beautiful work of all mediums on display and for sale. I have been trying out some more pieces and will be exhibiting them in July with Guildford Arts. . . watch this space! After a busy time at the end of last year with Christmas Sales and event, I shall be working on some pieces for a couple of exhibitions coming up this year. Watch this space for more details! I shall be taking part in the annual St Saviour's Women's Christmas Craft Market on Friday 25 November from 7.30 pm to 10 pm at St. Saviour's Church, Woodbridge Road, Guildford GU1 4QD. It promises to be a fab evening with live music, mulled wine, chocolate fountain, pamper zone, Christmas Crafts and lots more. Tickets £4 in advance (conc) via Eventbrite or £5 on the door, all in aid of Surrey Women's Refuge. More details from st-saviours.org.uk/christmas. Why not come along and make some beautiful glass decorations for Christmas, either for your tree or to give away as gifts? Drop me a line via my contact page for more details. 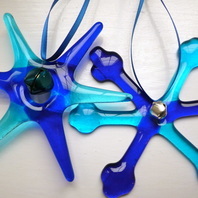 Booking is now open for my Fused Glass Christmas Workshops at Cranleigh Arts Centre. 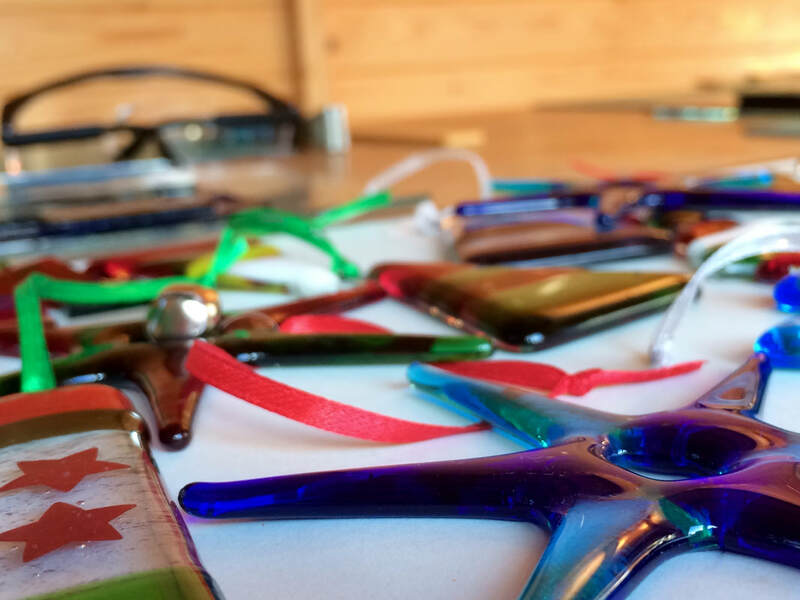 I will once again be running a workshop dedicated to making beautiful Christmas decorations by using coloured glass which you will be taught to cut, assemble and pack in a kiln. Work will be ready to collect after firing at the Arts Centre. These courses have proved really popular, so book early to avoid disappointment! During the month of July I have some work on display (and for sale) at Cranleigh Arts Centre, 1 High Street, Cranleigh GU6 8AS in their exhibition entitled 'Space' featuring the work of local artists. It runs until 23rd July, free entry and open daily. 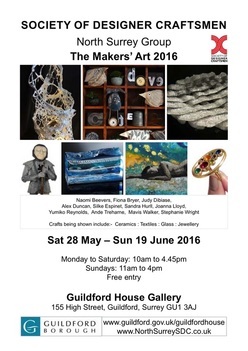 The Makers' Art at Guildford House Gallery, GU1 3AJ is now in full swing. We have work from members of The Society of Designer Craftsmen including Ceramics, Glass, Textiles and Jewellery. I have some new lighting on display which I have been working on with a fellow artist working with wood. Do come along and take a look. . . we also have a Pop Up Shop in the Garden Room! Busy making and collaborating with a fellow artist for some Lattice Frost Lighting pieces for the upcoming exhibition at Guildford House Gallery in May, The Makers' Art 2016. There will be lots to see and I will be exhibiting with fellow Artists from the Society of Designer Craftsmen working in glass, ceramics, jewellery, textiles, stitched work and much more. HAPPY NEW YEAR! I have a couple of exhibitions planned already for this year and will be working towards them - watch this space. 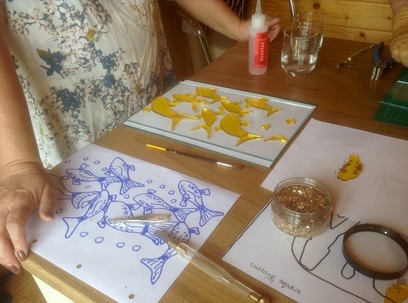 I will also be running a few more Fusing Workshops in Cranleigh and in my own studio too, more details soon! I've been busy running courses at Cranleigh and in my own studio, making work for the Christmas Ornament fair in Henley and Cranleigh and getting in the festive mood ready for Christmas Crafts at St Paul's, Dorking on 28th November. Lots to do at this busy time of year, but it's all good fun! More details on my Exhibitions page. 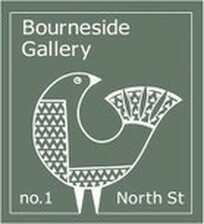 The Bourneside Gallery, 1 North Street, Dorking are hosting a new exhibition entitled 'Coast/' As much of my work is inspired by walks along the sand on the South Coast and North Cornish Coast, I have been invited to exhibit some of my sculptural centrepieces as part of the exhibition later this month. Cranleigh Arts Centre will be having a 'Creative Arts Week' in August and I shall be running a couple of workshops with a summer theme, more details soon. 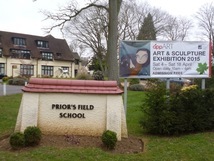 . .
All set for the AppArt Easter Exhibition at Priors Field School, Godalming - the outdoor sculpture trail opened at the end of March and the indoor exhibition, where I have two of my sculptural pieces, will be open on 4th April running until 18th April. Well worth a visit, with over 200 Artists exhibiting! 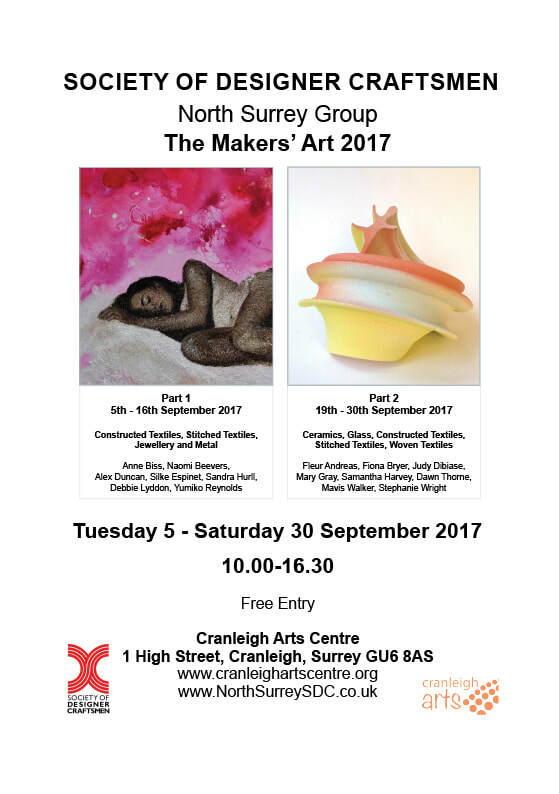 February looks to be a busy month with a Glass Fusing Course at Cranleigh Arts and work in their Handmade in Cranleigh Exhibition. I shall also be preparting for The Guildford Arts - Art@Clyde Exhibition which will be starting at the end of February in Guildford. 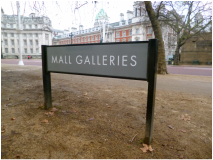 The 25th Designer Crafts at The Mall Galleries, London got off to a flying start with a stream of visitors and an excellent Private View evening. The exhibition runs until 17th January and is well worth a visit to see the work of artists and designers who are members of The Society of Designer Craftsmen. 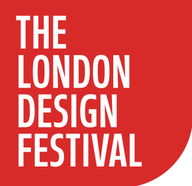 I am exhibiting for the first time with the SDC as a Licentiate. The Artists and Makers Guild, who promote creative talent, are showcasing work at local Christmas Markets in Godalming, Farnham and Guildford in November and December. Some of my decorative Christmas items will be on sale a the markets. More details on my blog page. 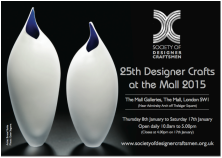 Following on from the success of 33@Oxo, I have been selected by the Society of Designer Craftsmen as a Licentiate to take part in Designer Crafts at The Mall Galleries in their next exhibition in January 2015. Hot on the heels of graduation, I am taking part in an exciting exhibition entitled 'A Glass Act' at the Bilston Craft Gallery in Wolverhampton. 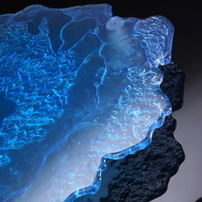 'A Glass Act' investigates what the practical and aesthetic qualities of glass are that make it desirable in our kitchens and on our tables today. 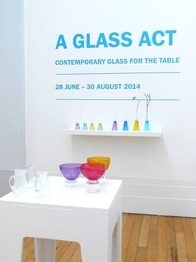 The exhibition celebrates the diversity and relevance of contemporary glass tableware, featuring numerous functional objects for domestic use from the everyday glass tumbler through to intricate candelabras and everything in between. 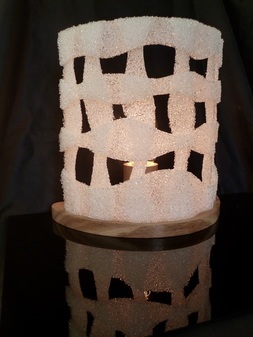 Currently finalising a BA (Hons) at The University for the Creative Arts in 3 Dimensional Design, I am working on a series of sculptural centrepieces and wall panels cast in lead crystal glass. My work for the degree show takes direct inspiration from woodland trails and incorporates texture, blending of subltle colours and soft contours. Final work will be on display at the Graduate Show at UCA Farnham from Friday 23rd May to Friday 6th June. Please check the university website for opening times.